I told you what a webinar is, but now how do you go about in making one? There are several factors that you need to take into consideration so you can have a successful webinar. First off you need to put together a support team. 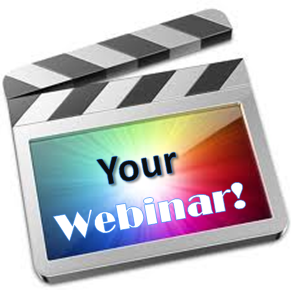 In general there are three main players in making a successful webinar. You have your organizer, the presenters and the assistants. These roles can be designated however you see fit but it’s a good idea not to do it yourself, as it’s extremely overwhelming. The organizer is responsible for developing the webinar topic, locating a speaker, marketing the event, setting up the registration etc.. The presenter is the individual who speaks during the webinar and the assistants take care of everything else that you delegate to them such as answering technical and logistical questions. Next you should figure out the format you want to have, a webinar can be structured in a variety of formats to suit different purposes. Such as having only one speaker, keeping an interview style or having an interactive format. There are pros and cons for every style but you need to determine what would suit your topic and audience. Webinars rely heavily on audio and visuals to get the message across, both should be engaging. Therefore prepare your visuals beforehand to have a smooth flow to your presentation. Next in the process is to determine what web conferencing platform you want to use. Factors to take into consideration when making this decision are- how many people will the tool accommodate? How much will it cost? What features are included? You can find articles on TechSoup.org and Idealware.org that help you understand and pick a tool for your webinar. Next you should have a dry run of the webinar to work out any kinks there may be. During your run make sure to note that you have all the proper equipment and a backup plan because technology can be unpredictable. Next you need to figure out your price structure.. Keep in mind that some webinars are free, most usually cost anywhere from $25-$40 and others may be upwards of $200. You need to assess your audience, but be cautious because raising your price might drive people away. Something you can do is ask for optional donations until you figure out your audience. Lastly, you need to promote and provide essential info on the webinar. It’s hard work but if done right the payoff is huge.